The Sedge Wren, formerly the Short-billed Marsh Wren, is one of the most nomadic terrestrial birds in North America. It is broadly distributed across the western hemisphere with many isolated populations occurring in North, Central, and South America. The Sedge Wren is found in habitats that are susceptible to both extreme drought and flooding caused by variations in rainfall. In Tennessee the Sedge Wren is typically found during spring and fall migration with a few birds lingering through the winter. Description: The Sedge Wren is a small and lean wren with a relatively short bill, an indistinct eyebrow stripe, and a conspicuously striped crown and back. The throat and belly are whitish with a tawny-brown wash on the breast, sides, and under tail-coverts. Voice: Song begins with two slow dry staccato notes, ending in a longer chattering chip chip chip churrr. Call is a series of chip notes. The Marsh Wren is the only other wren commonly found in wetland habitats. It is a larger and less pale version of the Sedge Wren, but with no stripes on the head. The song is diagnostic in separating these species. Habitat: Grassy or shrubby fields and wet meadows. Diet: Primarily insects and spiders. Nesting and reproduction: The Sedge Wren has not been documented nesting in Tennessee; however, there are scattered summer records with possible nesting. 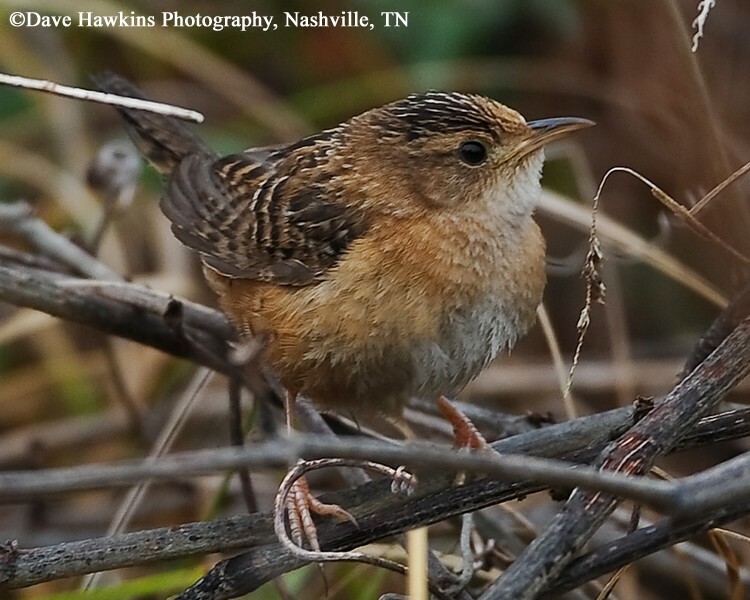 Status in Tennessee: The Sedge Wren is an uncommon migrant and rare winter resident. During spring migration it is found primarily from late April through mid-May, and in the fall from late July through late October. In winter it is most likely to be found in December in Middle and West Tennessee. Populations appear to be increasing rangewide, but population densities vary widely. Sedge Wren nesting density varies greatly across the breeding range. Specifically, a peak of nesting occurs in the upper-Midwest and adjacent Canada in late May and June, while a second peak occurs at more southern latitudes, including Nebraska, Kansas, and Missouri from July through September. One possible explanation is that some individuals attempt to nest at higher latitudes then move south and attempt to nest again. Vegetative succession and disturbance from grazing, and other agricultural activities may affect the variable nature of Sedge Wren nesting habitat. Best places to see in Tennessee: Grassy or shrubby fields and wet meadows statewide during spring and fall migration. Herkert, J. R., D. E. Kroodsma and J. P. Gibbs. 2001. Sedge Wren (Cistothorus platensis), The Birds of North America (A. Poole and F. Gill, eds.). The Academy of Natural Sciences, Philadelphia, PA, and The American Ornithologists' Union, Washington, D.C.